This beautiful scroll was commissioned by a bonsai artist at the Golden State Bonsai Federation convention in Sacramento. This is for a winter season poem, which is not written yet. I think the gray cloth is a perfect way to express the chill air felt on a snowy day. 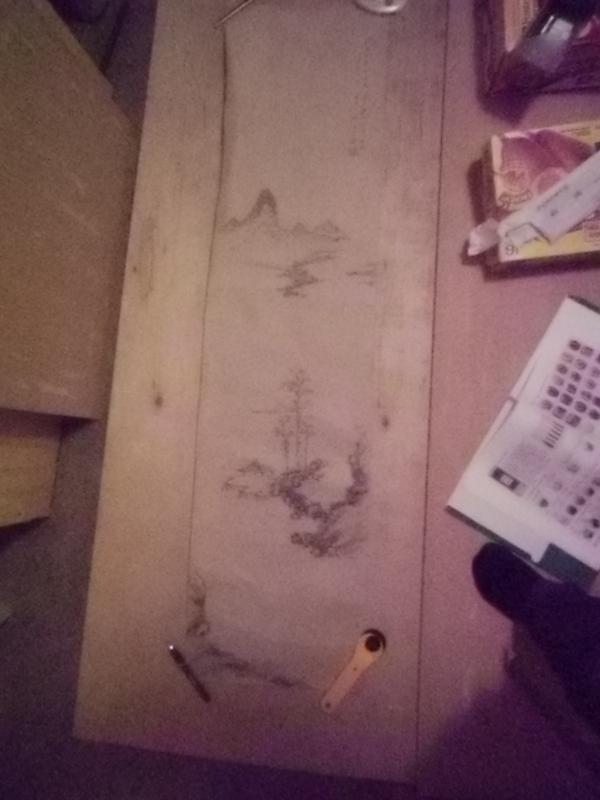 Hopefully, we will have a chance to see the scroll paired with a beautiful bonsai at an upcoming exhibition. In the previous post, we showed pictures of the painting with the Ichimonji and Hashira intact. 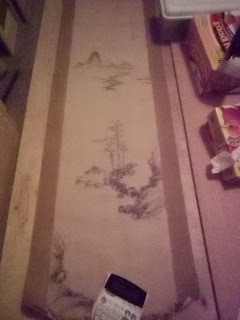 The second photo was of the painting after the Sou & Hadaurauchi were removed. (These are additional layers of backing paper). This photo is of the painting with a new Hadaurauchi applied. It helps remove the wrinkles, and repairs the tear, and helps to minimize the yogore or stains on the left hand side of the painting. I got the cloth in from Japan last week, but want to give this one a little time on the drying board. Besides orders for new scrolls I am working on an order for a remount. This painting is on paper, and there was no Ten and Chi. Also there were small sections with yogore and one slight tear. Last night I spent a good while carefully removing the Sou and Hada Urauchi. 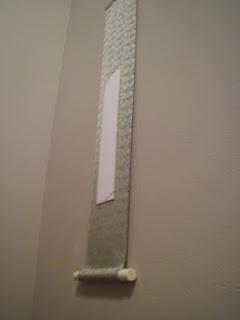 The Hada urauchi is the first paper used to back the painting and cloth. The Sou urauchi is the layer of paper used to seal all the assembled pieces together. I will keep everyone apprised of some of the steps to the finish. This was my first go at displaying the Yosemite waterfall scroll with a plant. It takes a lot of effort to get it...I will next put down a Blue Shitajiki to have a better background for the Jiita. I wanted to use some cattails, because they were still intact when I left for the Golden State Bonsai Federation convention in Sacramento. However, when I came back there were none available for use. I should also shorten down the daisy to be less high than the rush weed. Also it is obvious that I am not the best cameraman.